Incorporating additional material on climate change and migration, this leading text examines the nature, extent and dimensions of international population movements and of their consequences. International migration is a central feature of the contemporary world, with the political salience of migration strongly increasing in recent years. The fifth edition of this leading text has been substantially revised to provide an up-to-date and comprehensive assessment of the nature, extent and dimensions of international population movements, as well as of their consequences. This text firmly contextualizes the main issues, theories and history that contribute to the field, accounting for the relationship between globalization and migration. The global economic crisis, increased labour migration, climate change, and technological advancement are expertly covered by this text. 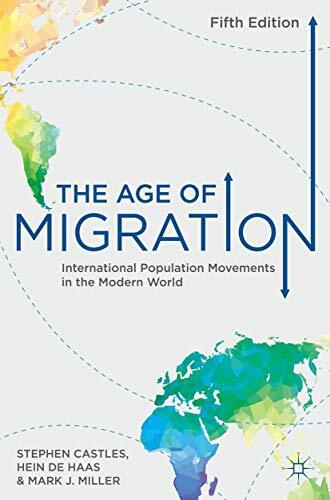 In having extensive coverage of regional case studies, and discussing these in comparison with international trends, the authors offer the most systematic analysis of the effects of migration possible. This text seeks to act as a holistic companion to any student studying international migration. As well as the pedagogical features within the textbook, the book's companion website helps to consolidate learning by providing additional resources, including further case studies, links to external web-pages and a web-only chapter. It can be accessed at: www.age-of-migration.com. Castles, Stephen; Haas, Hein de; Miller, Mark J.